Playing host to North Fayette Valley in a make-up game Saturday night, the South Winn boys’ basketball team (12-7, 12-4 UIC) won the thriller, 56-54. The TigerHawks outscored the hosts 22-15 during the first quarter before SW rebounded to pull to within four, 30-26, at halftime. It was South Winn’s turn to dominate the basket in the third quarter to pull ahead, 43-39. 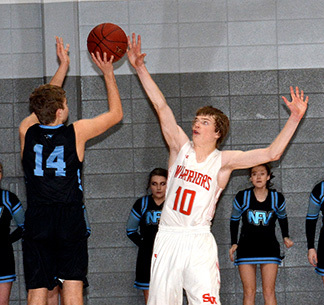 It was a tight finish for the Warriors in the final frame, with NFV having several chances to knock down go-ahead baskets; however, it the was the staunch SW defense that kept the visitors from scoring in the closing seconds. Leading by two with 1.8 seconds remaining, NFV inbounded the ball near half-court looking for the open shot when senior Paul Hageman got his hand in front of the potential-buzzer shot for the block. Sophomore Jacob Herold had a stellar offensive night with 29 of the Warriors’ points to go with five steals. Collin Wiltgen connected for seven points with three rebounds. Jaron Todd added five points and five rebounds. Hageman, Noah Tieskoetter and Trey Kriener each provided four points. Also in the scorebook was Carter Wenthold with three points. The Warriors are in District 5 and will face MFL MarMac in the quarterfinals Thursday, Feb. 14, at 6:30 p.m. at Dunkerton. The winner will face either Kee, Starmont or Dunkerton Tuesday, Feb. 19, at 8 p.m. at Dunkerton in the semifinals.